It is a Medeival town with more churches than residents. It is accessible only by foot or donkey. A causeway connects the island to the mainland and the city gate is low and narrow. The "sole entry" (moni emvasis, in Greek) gave the city its name. Monemvassia, is a well-known medieval fortress with an adjacent town, located on a small peninsula off the east coast of the Peloponnese. More than forty churches are strewn among the narrow streets. 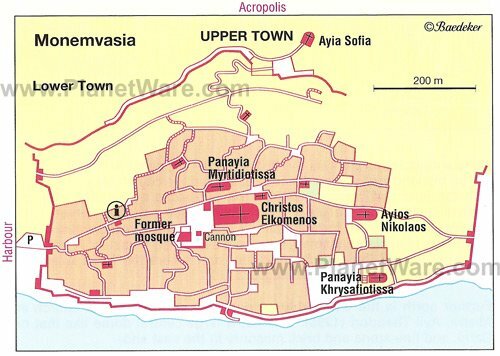 The most important and the largest is the church of Elkomenos Hristos (Christ Elkomenos = Dragged to the Cross), the cathedral of Monemvasia, It was famous for the picture of Christ Elkomenos, which was removed by Isaak Angelos and transported to Constantinople. The temple was founded in the 13th century by the Emperor Andronicos II Paleologus but was given its later aspect by the Venetians in 1691. Monemvasia was once on the Peloponnese mainland. Then an earthquake turned it into an island. It is now joined to the mainland by a narrow causeway that limits access, originally for reasons of defense. he upper town, long uninhabited, has narrow pathways leading to the Byzantine Aghia Sophia church, and remains of the medieval fortress and walls. In the lower town, look for the bell tower that leads you to Elkomenos Square, with its namesake medieval Elkomenos Christos church and a small museum. The old part of Monemvasia is a citadel that's separate from the town. Originally it was an island. Then a viaduct was built to connect it the mainland. One can hike to the top of it for a wonderful view of the area. The path up to the top is somewhat steep and the pathways have become smooth due to a lot of foot traffic. If you go, wear shoes with a good grip. Monemvassia's nickname is the Gibraltar of the East or The Rock. The rock is 300 m tall and 1.8km long. The rock on which it is built, 300m. high. Public transport or taxi? There's no need for either, but in any case, cars are not allowed on the island. Just walk along the cobbled streets among the stone houses, slow down and enjoy the peace and quiet of it all. The one tour that most lines offer is to Mystras with a quick stop in Sparta (not much to see). Mystras was the last stronghold for the Byzantine Greeks trying to fight the Ottoman Turks. It, too, is a high fortress with an impressive castle and fine examples of medieval Byzantine architecture.